Last week in Bonn, during the ADP 2.10 (the 10th Part of the 2nd Session of the Ad Hoc Working Group on the Durban Platform for Enhanced Action), there was a general sense that too little progress is being made toward estabishing clear foundations for the text-specific negotations for the Paris agreement. There are many explanations for why, but one stands out as potentially the most instructive and useful: everyone knows what needs to happen, yet no one is fully confident that all others will go far enough, fast enough. This is the Bonn Conundrum. Joe and Laughlin with the ADP Co-Chairs, just prior to a briefing for observer organizations. Photo by Miroslav Polzer, Secretary General of IAAI. All 196 Parties need to agree on a comprehensive pathway to full decarbonization of the global economy. Countries that have less technical or administrative capability need to get more. We need rapid development of low-carbon technologies, and every nation needs to be able to deploy them affordably. Monitoring, reporting, and verification (MRV) need to be well-designed, well-resourced, and well-executed. Adaptation and resilience have to be part of the overall effort to limit the scope of climate risk and harm. Sustainable practices have to be designed into government, business, agriculture, water use, industry and everyday life. Participation of citizens, stakeholders and communities has to be built into many other areas of climate action. The Agreement needs to have legal force and be enforceable, so all Parties move forward together. On decarbonization: how quickly, and who leads? On capability: whose responsibility, and who pays? On technology: businesses and governments don’t want to give away valuable intellectual property. On MRV: who does the monitoring, and how to retain sovereignty while being monitored? On adaptation: many feel mitigation is the more efficient investment, but many parties suffer more impacts than they generate. On sustainable practices: it is not clear there can be a coherent uniform standard for achieving this; where does it fit? On participation: many governments frankly are afraid of public participation. On enforceability: again, sovereignty… and, who is the enforcer? As a result, we have a lot of talk about what the focus should be, what concepts are central and useful, and what constitutes practical negotiation on practical matters. The process feels, at times, like it is in a holding pattern, because the Bonn Connundrum is at work in everyone’s mind. Because negotiators are people, it is often the case that a good idea falls on deaf ears, only because those listening started the meeting with a different idea. Stocktaking session in the Genf plenary hall. For many who are working to secure a serious outcome, forfeiting the floor in this way is unthinkable. The process has its structure, and most countries are part of one of the Major Groups, so they were most likely just deferring to the designated speaker for their Major Group. But difficult as it may be to administer, we should ask for a process in which, somehow, more people have a voice. Uncertainty about what it will take to bring everyone into a true collaborative framework is rooted, in part, in the guarded way in which governments hold back on their most ambitious vision. Governments holding back this way can give us more time to solve tough issues. (There now remain only 7 days of actual negotiating time remaining before the Paris conference.) That said, when you have a seat at the table, when you are formally one of the workers in the global policy workshop, you have something of value that most people can only dream of having. What we need now, after decades of slow progress, is to open this whole process up to as many people as might join. We can get more input from more corners of global society, and ensure that stakeholders’ local genius is treated as an asset to the selection of globally agreed policies that will operate locally. In many ways, the process is working, and evolving appropriately toward ever greater efficacy. The Co-Chairs of the ADP—pictured above—have been working to liberate the negotiating process from the tendency of nations to withhold and to counteract; they are innovating, and the complexity of their innovation has built trust and momentum. 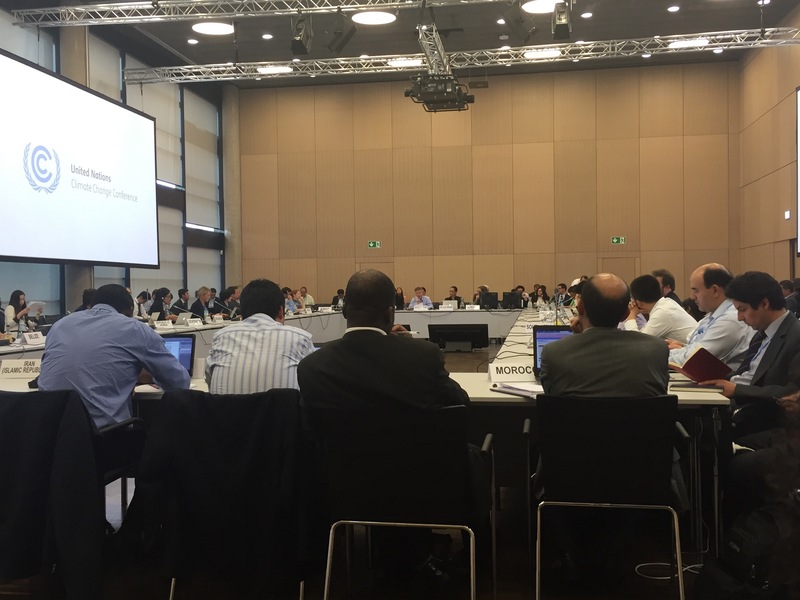 What we now have to grapple with is this particular tension witnessed during the ADP 2.10 in Bonn. Meeting of the Facilitated Group on Finance. there is more economic opportunity, for all nations, in success than in failure. We can move forward, and we need to make smart, clear, collaborative choices. Sooner, rather than later. We cannot afford any amount of backsliding, and we don’t need to. Backsliding now is a hapless indulgence. We know what we need; now, we have to put it in writing. Listening > Envisioning > Listening > Improving > Listening > Deciding together. Pathway to Paris team member John Hansen talks carbon pricing and negotiating text with one of the negotiators, after one of the meetings of the Facilitated Group on Finance. There is not always enough careful, attentive, participatory listening between and among the negotiating teams. For many reasons, time constraints mean one small team of negotiators has to cover more subject areas and meetings than they possibly can, and some important ideas are treated as already understood, when in fact they are new, fresh and deserve a more thorough hearing. It is through this more engaged and careful listening, putting aside some of the tactics that have disrupted progress before, that we can find the appropriate strategies for moving across one or another divide and finding common ground. Negotiators are looking for ways to bridge distinct policy areas together and to destribute policy prescriptions across the Paris Agreement and COP21 Decision. Citizens and stakeholders are looking for ways to help their governments understand their needs and their aspirations. NAZCA: The Non-state Actors Zone for Climate Action is tracking non-state actions to mitigate the both risk and harm and to build a climate-smart future. The World We Want: Hosted by the UN Millennium Campaign, the World We Want is an open, global platform for substantive direct participation in global policy-making. CCEN: The Citizens’ Climate Engagement Network will emerge from the Pathway to Paris project, bringing people together from across the world in Minneapolis in October and then in Paris in December, to support and sustain direct citizen engagement in global climate policy. P+PP: The People and Planet Project is building a global action network for social good, which will empower individuals and groups to use their networks to share and expand resources, and support stronger outcomes on the Sustainable Development Goals. GloCha: The Global Challenges Action Network will be built around a shared global fund, designed to support non-governmental organizations that work as an auxiliary engine to the UN system. There are many other networks pulling together good ideas from everywhere. Bridging the spaces between these networks of networks allows us to bridge the spaces between people and those who make decisions about global policy. By sharing information and experience more openly, we can go far together. We need a confident commitment to each of the known needs from the top of this article, and to supporting this kind of openness and integration. The next meeting of the ADP has to be open, inclusive, focused on specific working objectives, and timed and managed to facilitate ongoing collaborative success.